The Zebra FX7500 UHF RFID Reader has low profile, compact footprint is at home in nearly any business environment and its plenum rating enables discreet installation. The new RFID radio is designed from the ground up to deliver faster and more accurate read rates, as well as more consistent performance — even in challenging environments. Zebra’s software-based radio design delivers superior future proofing. As RFID continues to evolve, the radio can be easily upgraded with new software to support new features — there’s no need to rip and replace. And installation of this plenum-rated reader couldn’t be easier — just hang the supplied bracket and snap the FX7500 in place. Purposely designed from the ground up, Zebra's new FX7500 fixed UHF RFID reader, uses newly created RFID radio technology, for faster, more accurate read rates which result in more consistent performance even in challenging environments. This software based radio frequency technology effectively future-proofs your RFID investment by delivering flexibility to implement future upgrades and improvements with minimal investment. 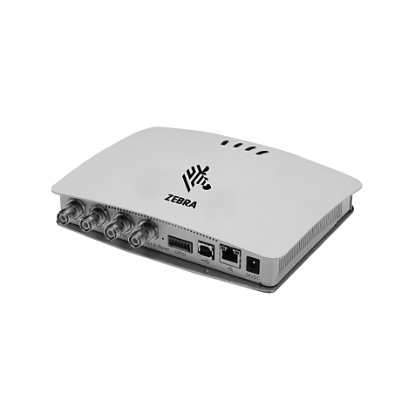 Paired with a new, more flexible Linux-based network architecture that integrates the tools and open-standard interfaces you need for fast, easy deployment with your RFID and back-end applications. The result is a fixed RFID reader that sets a new performance standard – delivering peak performance at all times with excellent reader sensitivity and better interference rejection, at a lower cost per read point. It works better and costs less ! Seamlessly integrates with existing IT environments; enables remote and centralized management; simplifies and reduces the cost of set-up, deployment, testing and management.